To the extent the Times is concerned with legality, it is only so in a very narrow, domestic way. What international law says about the US-led bombing of Syria is hardly broached, much less explored. Like the scores of US drone bombings and special forces deployments, it just is. The New York Times argues that Congress has a duty to authorize war–rather than a responsibility to determine whether war should be fought. As reports come in detailing the degree to which Donald Trump has escalated the “War on ISIS”—and killed hundreds more civilians in the process—this would seem like a good time for the country to sit back and examine the United States’ approach to fighting “terrorism” and its recent iteration, the so-called Islamic State. Not for the New York Times editorial board, which didn’t take the wave of civilians deaths as a reason to question the wisdom of America’s various “counter-terror,” nation-building and regime-change projects in the Middle East, but instead chose to browbeat Congress into rubber-stamping a war that’s been going on for almost three years. But as the American military is doing its job, Congress is refusing to do its duty. Nearly three years into the war against ISIS, lawmakers have ducked their constitutional responsibility for making war by not passing legislation authorizing the anti-ISIS fight. 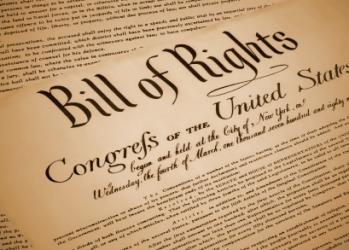 Congress does not have a “constitutional responsibility for making war”; it has a constitutional right to make war, which is to say it can authorize it or not authorize it. Congress is under no obligation—legal, moral or otherwise—to rubber-stamp existing wars started without its consent. Presidents, on the other hand, do have a duty under the Constitution to get Congress’s approval before waging war. Originally launched in August 2014 under the auspices of “targeted,” “limited” airstrikes to stop an impending genocide, the war on ISIS has since expanded to include four countries, 50,000+ bombs, 1,000 attacks on civilians and over $11 billion handed out to defense contractors. 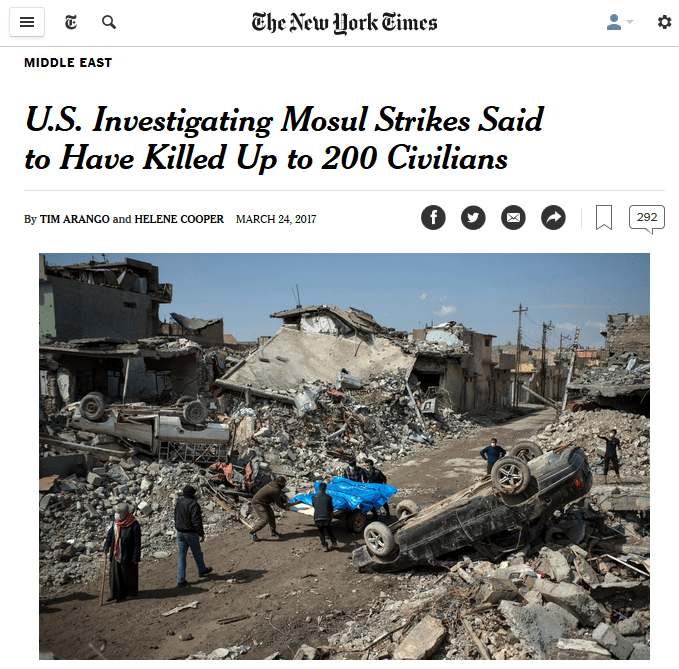 The New York Times chose not to editorialize about the US killing hundreds of civilians, but rather about getting a congressional seal of approval on the war that killed them. The Pentagon has operated under the 2001 authorization for the use of military force that was passed after Al Qaeda’s 9/11 attacks. But that justification is of questionable legality because ISIS did not exist when the authorization was approved. The United States can claim a legal basis for its involvement in Iraq because Baghdad sought American help…. But there has been no such request from the Syrian government, which believes that a US-led attack on Raqqa would be illegitimate unless it were coordinated with Damascus, the chief Syrian negotiator to peace talks in Geneva, Bashar Ja’afari, said on Friday. Such coordination is unlikely, given how little the Pentagon thinks of President Bashar al-Assad and his Russian backers. 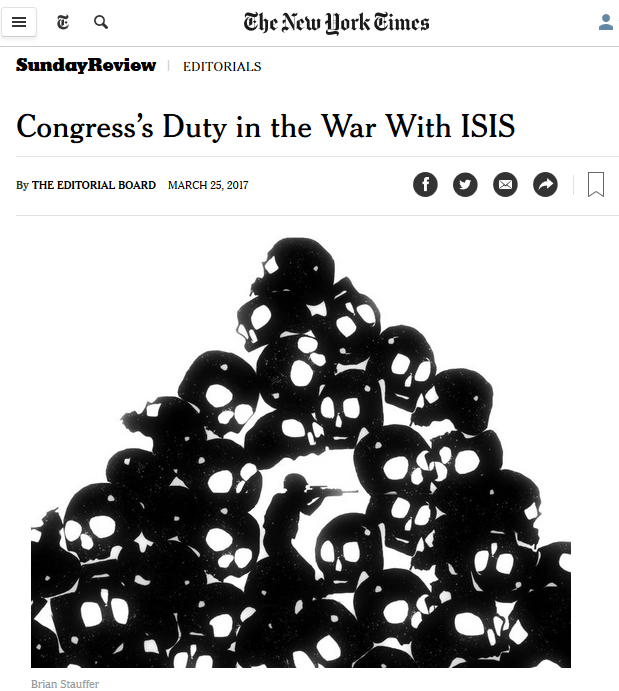 It’s not clear why the Times is bringing up Iraq and Syria’s differing stances on the US bombing their country; the approval of Iraqi government—which was ranked “not free” by the US-funded Freedom House at the time it green-lighted the US to bomb it—does not make a war unsanctioned by Congress any more constitutional. And a congressional OK would not make bombing a country’s territory against its government’s will any more legal under international law. But perhaps the key phrase here is “can claim a legal basis”; if an appearance of legality is more important than actually following the law, then any kind of official-looking action would be better than nothing. And the Times (8/7/14) had no apparent problem with President Obama using the 2001 AUMF to launch the war in the first place. It did not then mention what it now calls the ”questionable legality” of the authorization, instead playing up the ticking time bomb nature of the war effort, and even going out of its way to chide Obama for not following through on veiled threats to bomb the Assad regime the previous year. The New York Times editorial board, as FAIR (2/9/17) has noted before, consistently protects and advances US national security orthodoxy. 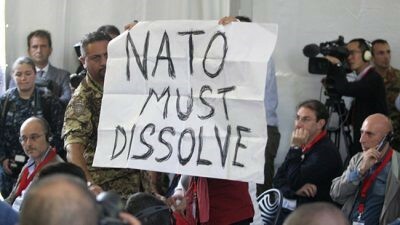 In the past 30 years—from the Persian Gulf to Bosnia to Kosovo to Iraq to Libya—the New York Times editorial board has never once opposed a US war. The Times’ power-serving function was starkly evidenced when in January 2016, it opposed the US bombing Libya to fight ISIS without congressional approval, only to do a 180 and endorse the war effort the day after President Obama began bombing in August 2016. The whole point of granting war-making powers to Congress, it should be noted, was so that Congress could serve as a barrier to war. Somehow for the paper of record, this task has morphed into a “duty” to approve wars that are already taking place, lest the self-evidently good and noble war effort be undermined. Adam Johnson is a contributing analyst for FAIR.org. You can find him on Twitter at @AdamJohnsonNYC. There is an interesting book by Howard Friel & Richard Falk titled, “The Record of the Paper.” It detailed how the NY Times was disingenuous in declaring they didn’t support the 2003 invasion of Iraq because, between September 12, 2001 and the day of the invasion, a majority of articles they printed about the criminal Bush administration’s decision to invade expressed support for the war using questionable sources.